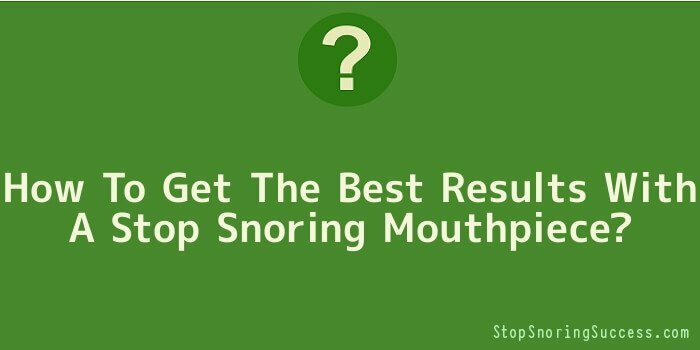 Using a stop snoring mouthpiece can be a great method for reducing and even eliminating snoring altogether, as well as correcting the cause of your snoring, but you want to make sure that you choose the best mouthpiece possible. Getting just any mouthpiece to stop snoring may not be effective, and may leave you with discomfort and the same issue. Not disturbing those who sleep with you should be a main objective, but your personal health should be a top consideration when choosing the best mouthpiece for your snoring cure. Using an anti snoring device can be highly effective, but only if you choose the best product available. The mouthpiece you choose should be comfortable when in use, promoting a healthy cure for your snoring. Using one-size-fits-all snoring mouthpieces can be very uncomfortable for the simple fact that it cannot be adjusted to fit your particular mouth. If it cannot be adjusted to fit your mouth, you could end up with a painful solution that is highly ineffective. By using a stop snoring mouthpiece that can be adjusted to fit your mouth perfectly, it will not only be a comfortable solution but will also cure snoring without causing harmful side effects, such as a change in bite, tooth movement, sore teeth or jaw joint problems. There are many people who snore that suffer from a severe overbite or under-bite. Many issues of snoring can be caused by a misalignment of the lower jaw. The further back the jaw is aligned, the more the snoring can be a problem. This can also contribute to sleep apnoea as the respiratory system is obstructed. A one-size-fits-all anti snoring device cannot be adjusted to fit a mouth with such a bite. Only the best stop snoring devices can ensure that your bite will be fitted properly to effectively stop snoring and ensure that the issue is treated appropriately, even if you have a severe overbite or an under-bite. Another issue that one-size-fits-all mouthpieces do not address is adjustability. To get the best results, a snoring mouthpiece should move the lower jaw forward in small increments to find the most optimal position to stop snoring. Each person’s anatomy is different and the best position of the lower jaw to stop snoring is different for each person. Only a customized, adjustable snoring mouthpiece will gradually move the lower jaw forward to find the best position to stop even the loudest snoring. This will also ensure the tongue is not pressed against the back of the airway, causing sleep apnoea, which is the cause of snoring in almost 50% of those afflicted. By ordering a customized, adjustable anti snoring device, you will be able to ensure that any condition, even a TMJ disorder, is accommodated by the mouthpiece, and that you will be comfortable wearing the mouthpiece. Also, a customized snoring mouthpiece can allow for lateral movement of the lower jaw so that if you grind your teeth in your sleep, your jaw muscle and jaw joints will remain comfortable during the night and when you awake in the morning.